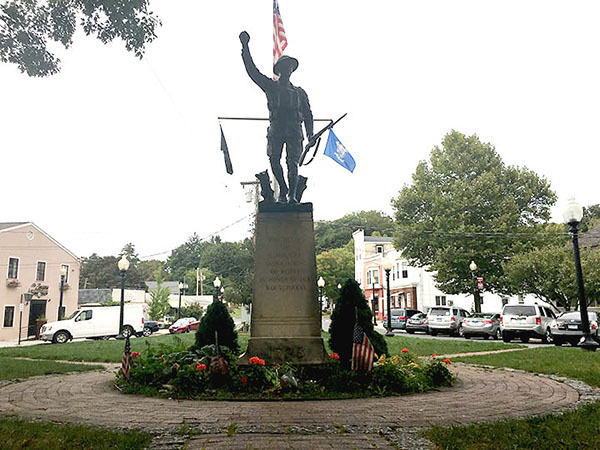 Melanie Espinal, journalism students at Southern Connecticut State University, reported this story in 2017 as part of Journalism Capstone coursework on World War I. 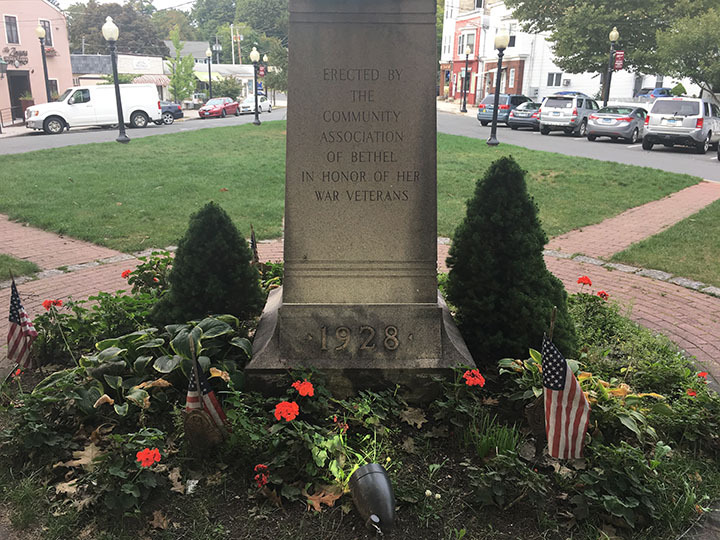 When Bethel sought to honor its World War I veterans, the town focused on the soldier rather than the usual rock, boulder or plaque. 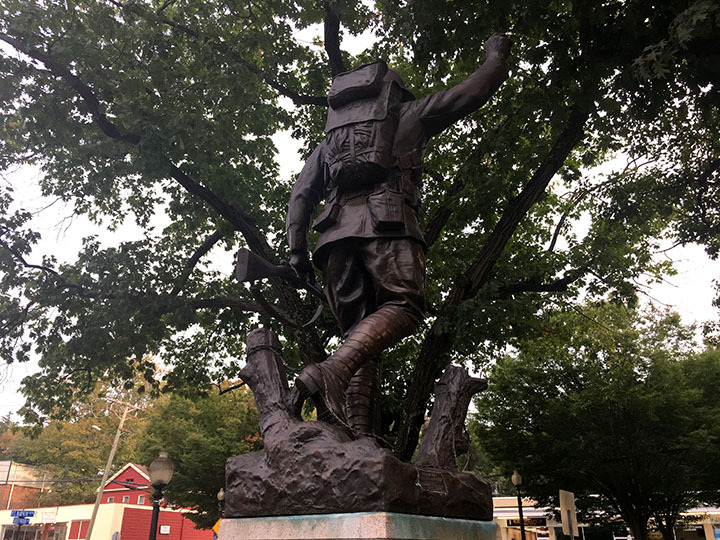 Instead, the memorial sculpture, “The Spirit of the American Doughboy,” by Ernest Moore Viquesney, depicts a doughboy in stride. Standing in P.T. Barnum Square, the bronze alloy figure extends his right arm, holding a grenade, and holds a 1903 Springfield rifle down at his left side. It was made in 1928 with the least expensive material at the time, copper. It’s filled halfway with concrete, and a rod was placed down his leg and into the base for stability. Patricia Rist, Bethel’s Historical Society president, said even with these precautions, the 200-pound statue began to lift off its base, and needed repairs. Rist and other members of the society approached the town in June 2016 about the need for repairs, including removal of corrosion and the installing of a new mount. “I went to the town and said, ‘We need to fix this, will you fund it,’” Rist said. Polich Tallix, a fine art foundry in New York, quoted $10,300 for the repairs. The Board of Selectmen unanimously approved the funding on June 21, 2016. The statue was taken down for repairs that July. Rist said there were some residents who couldn’t understand why the town was paying for it. This wasn’t the first time the monument had been damaged. Rist said the statue’s arm had been vandalized sometime in the 1980s, but was repaired in 1991. Bethel’s doughboy, along with a statute depiction of showman P.T. Barnum on Greenwood Avenue ,and the Civil War monument in the Center Cemetery, are maintained by the Historical Society, with cleanings at least once a year. Behind the statue was originally a board that listed names of men from Bethel who served in World War I. But it disappeared and over the years no one knew what happened to it, Rist said. Rist grew up with a military cemetery right behind her house. Today, Rist regularly visits military cemeteries during historical walking tours in Bethel, and at times when locating graves for people. Rist said Bethel has always had a strong commitment to the war effort, with many men serving in all the wars since the American Revolution. Many of them joined organizations like the American Legion and Veterans of Foreign Wars after their service. 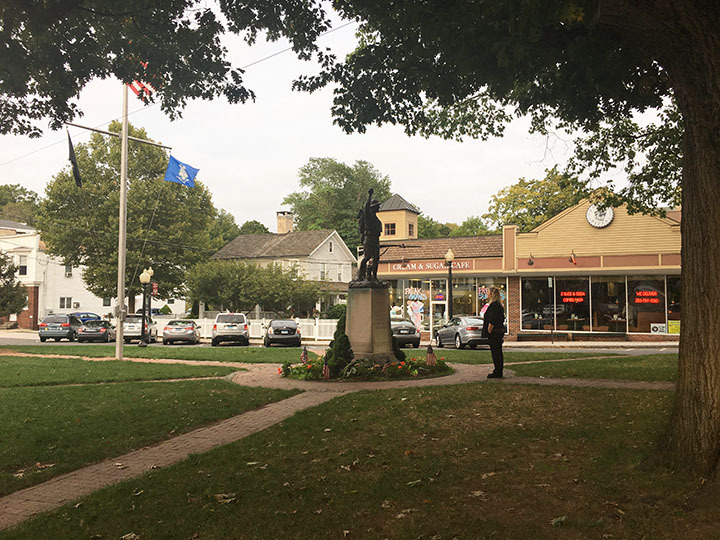 Remaining VFW members were among the 70-75 people who attended the rededication ceremony on Nov. 11, 2016, on Veterans Day, when the statue was returned to its home. American Legion and VFW member, Skip Clapp, was one of them. From a veteran’s point of view, the wasting away of memorial monuments is not a good thing, he said.